When it comes to water, Max Reich is more than at home. For years, Max has been setting records in the water with his swimming prowess. 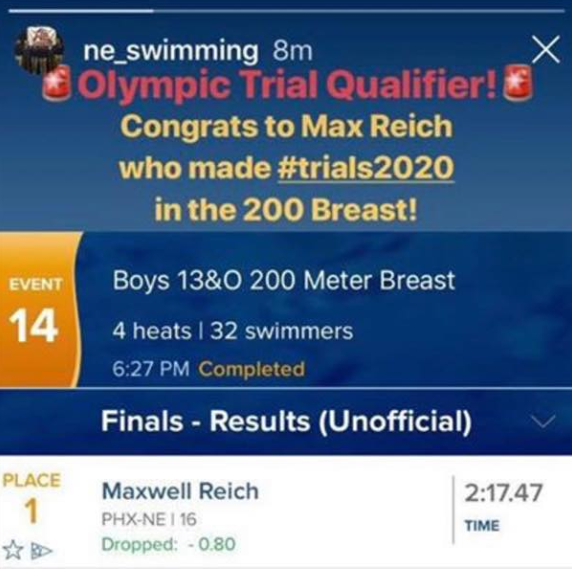 On Sunday at the 2019 NOVA LC Winter Invitational in Richmond, VA, Max earned 1st place in the 200 Meter Breast in a time of 2:17:47, thereby qualifying him for the 2020 Olympic Trials. To say that St. Thomas Aquinas High School is proud of Max Reich is an understatement. We are not only awed by his innate talent, we are inspired by his dedication and commitment to the sport that he loves. But warming our hearts more than all else is the fact that Max is humble, kind, and attentive to the accomplishments and aspirations of his peers. Congratulations, Max! Go for the gold!